Johnsonite Carpet Edge Guards are highly durable transition guards made of high quality PVC. These Carpet Edge Guards provide the perfect seamless transition between carpet and flooring. Available in a wide variety of color options. Complies with A.D.A. requirements of Section 4.5.2 Changes of Level. Standard formulation exceeds ASTM E 648 Class 1 Flammability requirements. We are installing carpet and vinul in our garage. Carpet meets vinyl in middle of room and carpet is just on floor like a rug not installed this is on a concert floor. What product do we need to transition the middle and keep everything down and in place? Hello, I have a padded carpet installed on top of tile. Which Johnsonite or Roppe carpet edge would work best? Hi there-- I'm looking at your carpet edge guards today and trying to figure out which one would work best. I think the height drop I'm trying to cover is pretty big (10 or 11 mm), so I would like to test if the 3/8 inch transition would work. Is there any way we could get a sample? I would also like to match colors. Thanks! Johnsonite® Carpet Edge Guards are highly durable transition guards made of high quality PVC. 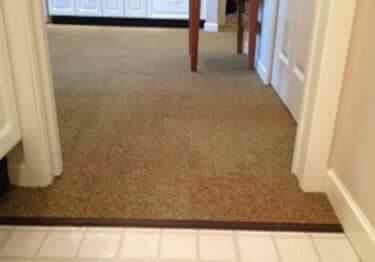 These Carpet Edge Guards provide the perfect seamless transition between carpet and flooring. Available in a wide variety of color options. Needed carpet to laminate flooring transitions strips. Worked great. I only needed one strip and very unfortunate the shipping cost was still so high. The customer was very happy with these products, along with the fast delivery. Keep up the good work! Worked perfect for our project - trimmed the carpet, rolled back the edge, stapled down the trim with a 1/4" "overbite" of the carpet, then used a tongue depressor to tuck the carpet back into the slot (we also used carpet tape on top of the trim before relaying the carpet into the trim).